Tania Nunez and her partner Dmitry Savchenko are both amazing talents; they are a joy to watch and a joy to work with. They compliment each other perfectly in both training and style. They were both star dancers in the American Dance Montage, a company directed by a well known choreographer, Frank Regan. They have won titles in a number of ballroom dance styles and have enlivened DanceInTime shows with their grace. Always flexible and helpful, the couple inevitably “wows” any audience! Ballroom and musical theater are their primary performance dances but they are trained in a wide range of styles. Now this amazing couple is available to do shows or teach workshops anywhere in the US and beyond. They each also offer private instruction. 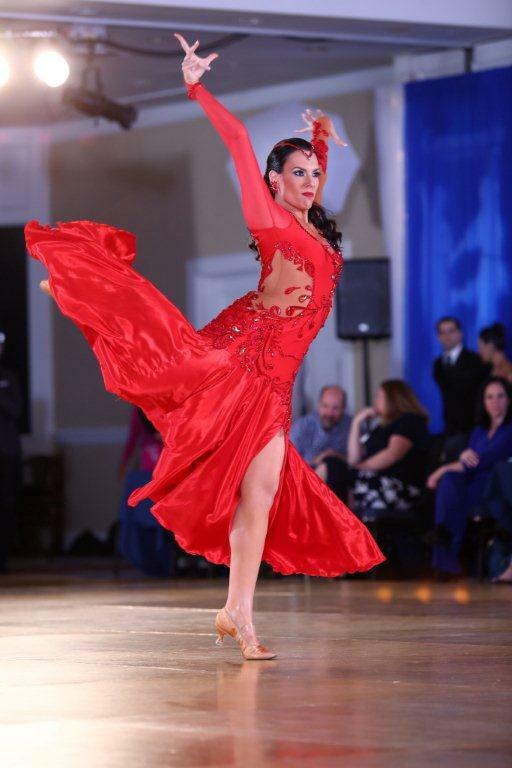 Check out their ballroom performance and competition videos below, as well as their biographies. And note that prior to dancing with Dmitry, Tania did some shows with the DanceInTime Women’s Team in the DC area, Miami and Puerto Rico. There is also a video of Latin dances the couple performed for some DanceInTime Hispanic Heritage Month shows. Dmitry Savchenko and Tania Nunez are professional USISTD certified ballroom dancers, competitors and teachers. They have both danced since a young age, training in ballroom, ballet, modern, jazz and contemporary. Dmitry and Tania formed their professional partnership in 2015 to compete in the American smooth division. While working with world class coaches they enjoy expanding on their passion for the art of dance. Their accomplishments include: Commonwealth Rising Star and Open Champions as well finalists in many other U.S events. Dmitry Savchenko and Tania Nunez dancing waltz. Choreography by Frank Regan. Dance Company: American Dance Montage. Dancers are Carlos Pabon, Fabio Bonini, Susan Cox, and Tania Nunez. American Dance Montage dancers Fabio Bonini, Susan Cox (in pink) and Tania Nunez (in blue) perform a "soft Tango." Choreography by Frank Regan. DanceInTime.com performed this original medley at the Puerto Rico Salsa Congress and at the New York Salsa Congress. Tania helped choreograph this piece, and she is the third lady to step on stage. DanceInTime tells a story with a Charlie's Angels theme through a Salsa presentation. This dance performance blends the art of story-telling with the art of dance, giving it a humorous twist. The dancers who play the role of the Angels, are given an assignment to steal back from someone a briefcase containing state secrets. Tania Nunez is the lady with the hat.